Successfully Added T95N-MINI MX+ Android TV Box - 4K, Android 6.0, Amlogic S905X, Kodi, HDMI, 1GB RAM + 8GB Memory to your Shopping Cart. Enjoy loads of watching options, a convenient interface and fast operation with the T95N-MINI MX+ Android TV box. Sporting 4K support, Almogic S905X processor, pre-installed Kodi and more, it’s an easy choice for making your TV a smarter. With the 4K Android TV box, you will not only get access to loads of great content, you will also have the intuitive Android 6.0 interface at your fingertips for better navigation of the big screen. Enjoy loads of upgrades and see your TV screen come alive. With access to the Play Store, you will be able to get more apps and games at any time. Thanks to the pre-installed Kodi 16.0, you will get access to lots of great free content from its repositories. Watch your favorite shows in 4K quality, organize movie nights and more. The TV box comes with 8GB of internal memory + you can add 64GB more externally — that gives you plenty of storage space for all your media. Having two USB ports, SD card slot and HDMI, the T95N-MINI MX+ sports great external connectivity. The Almogic S905X quad core processor ensures smooth operation and with the Mali-450MP GPU, you can also indulge in some gameplay. The T95N-MINI MX+ Android TV box is not only powerful but also portable, at less than 100 grams and measuring less than 10 x 10 x 2 centimeters this mini TV box can travel with you anywhere, letting you change any HDMI screen to a smart TV. This is great for rainy holidays as you can load up on movies and games to keep you entertained no matter the weather. 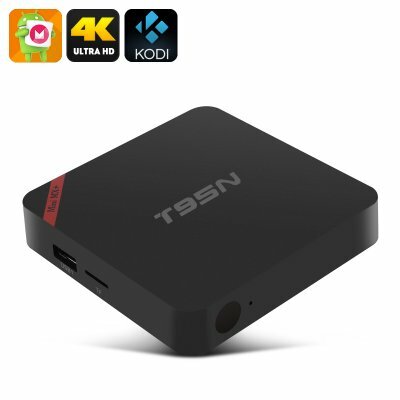 The T95N-MINI MX+ Android TV Box comes with a 12 months warranty, brought to you by the leader in electronic devices as well as wholesale Android TV boxes..
Fast delivery, small size, HDMI cable include; It is a very good product, I recommend. Is cheap !